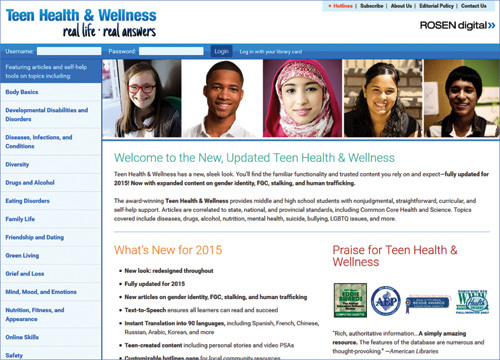 Whether seeking information for reports or for personal reasons, users will find a trove of material with Rosen Teen Health &Wellness. This comprehensive resource provides teenagers with accurate and timely information while supporting state and national curriculum standards and meeting the needs of students across the learning spectrum, setting the bar high for resources with similar scope. Cost Pricing for annual subscriptions begin at $595 and is tiered depending on the size of the school or library. Ease of Use and Visual Appeal The user-friendly interface allows teens to find and access material with ease, whether they prefer simple point-and-click navigation or keyword-based searches, and the clean, streamlined design makes this resource as aesthetically appealing as it is easy to use. The top third of the page features a colorful horizontal band of five diverse teens. The crisp white background and limited color palette in shades of blue provide a fluid look that puts the focus on the content. Major subjects are presented in a light blue column on the left side of the screen; once within a topic, users can continue clicking on links to access subsequent articles on the subject, or they can use directional arrows to move between sections. A green “Home” button stands out amid the blues and provides students with a quick way to exit any screen and return to the database’s landing page. Content Arranged alphabetically, 15 broad subjects, including “Body Basics,” “Grief and Loss,” and “Skills for School, Work, and Life,” serve as portals to more in-depth subject exploration. Under the broader “Mind, Mood, and Emotions” heading, for instance, teens will find “Academic Anxiety” and “Jealousy.” Users can also access information by selecting either the “Subject” or “A-Z” tabs. The former opens a new page that merely adds a descriptive blurb to each of the 15 topics, while the latter is a compendium of more specific topics arranged in alphabetical order. “Academic Anxiety” presents a thorough explanation of the disorder and its causes and symptoms as well as ways to manage it; the material is written or reviewed by a medical professional, lending it authority and credibility. Users can also share information via their preferred social media or favorite Web 2.0 tools. Other resources, such as organizations to contact and article citations in MLA, APA, and Chicago styles, provide additional support. “Dr. Jan’s Corner,” which features a licensed psychologist’s response to teen inquiries, offers straightforward, nonjudgmental advice. A “Hotlines” link features three major 24-hour services in bold red at the top of the page—Suicide Hotline, 911, and Crisis Call Center—as well as a comprehensive list of supportive organizations and their contact information for those seeking help. Another outstanding feature is the database’s adaptability, which enables users to access information in a variety of ways. Students can change the default language of English to one of 90 others. Similarly, those who are auditory learners or who read below grade level can elect to listen to an English-spoken narration. The database also includes a number of valuable extras, including “Tell Your Story,” where teens can read about another teen’s first-person experiences and then share their own stories; “In the News,” in which a current issue is featured and discussed; “Did You Know?” which introduces an interesting fact that serves as a discussion starter; and “Cast Your Vote,” an interactive poll on a health and well-being topic. A full glossary and helpful icons highlighting key information complete the user experience. Student and Teacher Resources Educators and other interested individuals can subscribe to a newsletter that alerts them to new features and offers suggestions for programming that can be used with teens. Those seeking more immediate updates can follow @RosenDigital on Twitter. Users can subscribe to RSS feeds for three of the database’s columns—“In the News,” “Dr. Jan’s Corner,” and “Did You Know?”—and are encouraged to suggest titles for the book lists, making the database a truly interactive and user-friendly experience. Verdict Rosen has succeeded in creating a resource that builds student knowledge and self-awareness as well as a sense of community, and it does so while meeting curricular standards and the varied needs of users of all abilities. This is a powerful and versatile resource. Audrey Sumser, Kent State University at Tuscarawas, New Philadelphia, OH.